When I stepped out of my home this morning, I saw a crow in my front yard. It reminded me of the crow who used to come to our house every morning in Bombay for biscuits. That crow would come and sit on the window and wait for his biscuit, and not just any biscuit, he'd take only a Goodday. If I try to give him anything else, he'd turn his head away and if I insisted, he'd take the biscuit and drop it on the ground. I have never had a pet and that was the closest to having one and giving him the biscuit each morning was a lot more than feeding a dog or a cow with leftover bread. The stray dog would gratefully take the bread or sniff it and walk away if he was not interested but this crow would stake his claim, it was like he believed it was his right to get that biscuit in the morning. Once we were making pakoras during navratra and he just refused to take anything else but the pakora we were frying, no bread or biscuit could make him go away. He didn't leave till we gave him the pakora. This morning when I came out with biscuits the crow was gone, I kept the biscuits on the pillar of the gate hoping he'd come back and eat them. When I went back in, Mira told me about the crow she saw a few days after we moved to Delhi. "He came to check on us at least once. He was sitting so close to Manu and me in the balcony. Usually crows don't allow anyone to come so close to them." I nodded but wondered if that can be true. Even if the crow has decided to follow us, how could he know where we have gone? 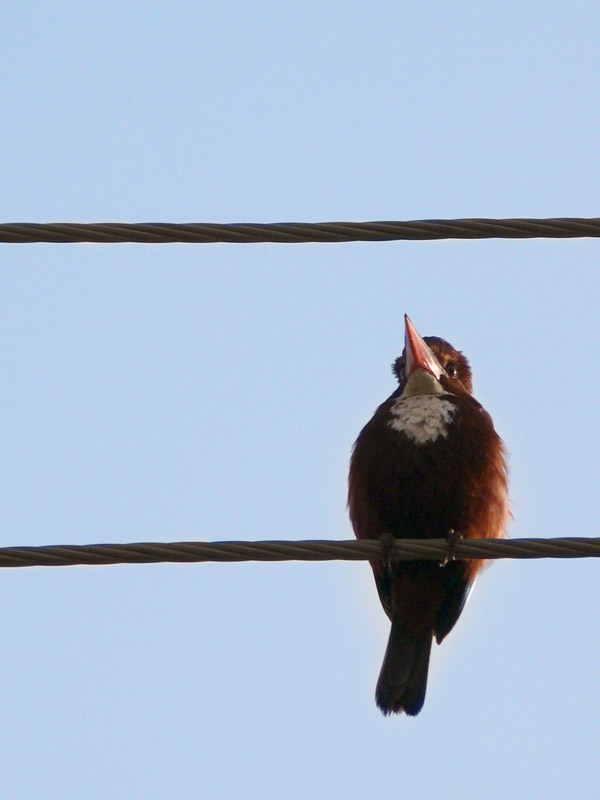 This, by the way is a kingfisher sitting on a power cable outside my home.